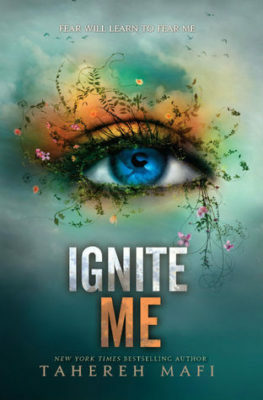 What happened in Unravel Me by Tahereh Mafi? Full recap. 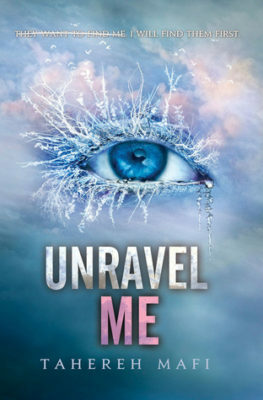 Read a full summary of Unravel Me by Tahereh Mafi now! This page is full of spoilers so beware. If you are wondering what happened in Unravel Me, then you are in the right place! What happened in Unravel Me? At Omega Point Juliette is not doing well. She has been unable to access her powers. She thinks people have heard about the boy she killed and are afraid of her. She feels they don’t like her. Juliette is not allowed to see much of Adam. Adam is having tests to find out why he is immune to Juliette’s powers but he won’t tell her how they are going. Juliette convinces Kenji to take her to the labs where she witnesses Adam’s tests which look very painful. Juliette loses her temper and her power flares cracking the walls and floor. She passes out. Three days later Juliette wakes up. Castle explains to Juliette that the powers they all have are called electricum. He explains to her that Adam’s power is to shut down other people’s powers. It happens when he feels threatened. Using it, however, drains him of energy and makes him weak. Adam no longer feels threatened by Juliette so his defense isn’t triggered and he is starting to feel pain from her touch. Despite Castle’s warnings, Juliette and Adam begin to get intimate. Adam collapses in pain and is hospitalized for days. When he comes out Juliette breaks up with him. They are both devastated. Kenji gives Juliette a lecture, telling her there are bigger things at stake than her teen romance dramas. The world needs them. Together they work out that Juliette’s powers are triggered when she experiences extreme emotion. Juliette crushes a brick despite having her gloves on and realizes she can never risk being with Adam as she could hurt him without even touching him. She decides to devote herself to the cause. Kenji includes Juliette in a mission outside Omega Point, to steal food. Whilst outside Juliette sees Warner playing with and feeding a stray dog. He sees her briefly then Kenji hides both of them with his invisibility power. The mission to steal food from a warehouse is a success and Juliette begins to feel camaraderie with her fellow Omega Pointers, Winston, Brendan, Emory, and Ian. Castle calls for Kenji, Adam, and Juliette during the night. He tells them the Supreme Commander, Warner’s father is in the Sector. He also tells them Juliette’s four new friends have been taken hostage. They have received a communication that if Juliette goes to a certain place at a certain time they will be released. Kenji and Adam will go with her but remain hidden. Other Omega Point soldiers will be ranged further out. Before they leave James seeks Juliette out. He is upset that they are supposed to be friends but he had to find out from other people that she killed someone. She tells him everything. They hug and she goes off to her mission. On the way to the meeting point, in an abandoned housing estate they see one house, still inhabited and well kept. At the meeting house, Juliette enters and speaks to Warner’s father. He is merciless even with his own son. He criticises Warner for letting her get the better of him. He tells Juliette that Warner begged his father not to kill her. The Supreme Commander tells her his name is Anderson and that Warner refused to use it. Warner is his mother’s last name. His first name is Aaron. Juliette realizes that Warner was an emotionally abused child. He was trained not to make mistakes, not allowed to show any emotion or affection. He tells Warner to shoot Juliette but Warner points the gun at his father instead. His father mocks him saying he has done this many times but never shot him. He slaps Warner. Juliette loses her temper and chokes Anderson. She drops him to the floor and shoots him once in each leg. Kenji comes in and stops her from killing him. He sedates Warner. Kenji tells her that they have Ian and Emory back and will trade Warner for the other two soldiers. He says that outside the war has started. Adam comes in and hugs Juliette. When he sees Anderson, though, he is aghast! Anderson is his father too. They take an unconscious Warner and leave. The Omega Pointers are fighting with the soldiers of Sector 45 and are vastly outnumbered. A distraction is needed so they can retreat. Juliette uses her power to put massive cracks in the ground under the opposing soldiers. Juliette, Adam, and Kenji who is still carrying an unconscious Warner, escape in a stolen tank. On the way back Adam tells Kenji and Juliette that his mum and dad were never married. His father loved his mother but was violent and abusive to Adam. He blamed Adam for his mother’s death saying he must have eaten too much of the food and made her weak. After she died he continued to visit for a while but only to be violent. He stopped visiting but still sent money for two years. Then Adam received notification that he was dead. Adam joined the army to support his younger brother, James. Back at Omega Point, Castle asks Juliette to interrogate Warner. He reasons that she is the best person since Warner can’t touch her and hurt her. Juliette doesn’t tell him that Warner can touch her. She doesn’t want Adam to find out. Juliette goes to Warner’s locked and guarded room. Warner has her notebook and reads to her from it. He tells her he was deeply moved by it. Juliette is embarrassed. During another emotional scene in a corridor between Adam and Juliette, Castle walks by with Warner (cuffed). Later Castle comes to her and tells her Warner mentioned he can touch her. He believes Warner is also ‘gifted’ and feels he needs to invite him to join them. He guesses that Warner is in love with her. He asks her to use this to continue the interrogation. She reluctantly agrees. She doesn’t tell Castle that Adam and Warner are brothers. She goes back to see Warner and finds him asleep wearing only his boxer shorts. His bare back is covered in scars and in the middle of his back is a tattoo of the word IGNITE. She is angry with him for telling Castle that he can touch her. He asks why it matters, if she hates him, then guesses she feels for him. Juliette considers what would happen if people began to think that she too was past redemption. She runs from the room. After being remonstrated by Castle for not getting information that would help find Winston and Brendan, Juliette hurries to question Warner again. She asks him about his tattoo and he shows her another low on his abdomen that says, HELL IS EMPTY AND ALL THE DEVILS ARE HERE. Warner tells Juliette where the hostages are, but also that his father, Anderson has plans to massacre the civilian population. The Omega Pointers quickly draw up plans to rescue the hostages and as many of the civilians as possible. In a mass meeting, many people want Warner executed but Castle tells them he has offered Warner a place at Omega Point. Someone asks how Castle knows Warner is gifted. He reveals Warner can touch Juliette. Adam storms out then Adam and Juliette have yet another emotional scene in the corridor. Warner arrives on the scene, apparently having been released, he and Adam square up for a fight. Both Juliette and Kenji rush to break them up and Kenji is afflicted by Juliette’s touch even though she is not touching him. He passes out. Juliette thinks he is dead. How does Unravel Me end? After staying late at the infirmary with Kenji, Adam and Juliette head back to their separate rooms to get some sleep before the big battle next day. Warner comes to Juliette’s room. He tells her he accidentally channeled her power into Kenji. Juliette and Warner kiss but then Juliette breaks away saying Adam’s name, feeling guilty. Warner storms off. In the morning Warner is gone. A still weak, Kenji announces he is still going with them. Adam, Kenji, and Juliette save some civilians but Juliette is captured. She is taken to the little house. Anderson is there, he tells her this is Warner’s mother’s home. He tells her Warner fought for control of the Sector to be near her. He has also brought Sonya and Sara, the Omega Point healers, here, to heal his legs where Juliette shot him. Warner is there too. Anderson shoots Juliette in the chest and leaves. Sara and Sonya can’t touch Juliette to heal her but Warner channels their powers and she is healed. Warner tells Juliette the battle is over and that they are ‘all dead’. There you go! That’s what happened in Unravel Me. Hope you enjoyed this recap of Unravel Me with spoilers. 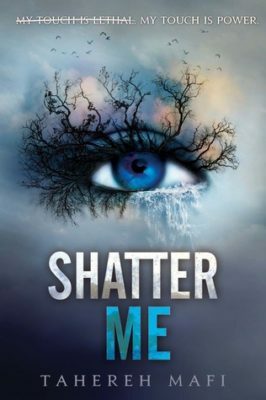 Ready to read or re-read Unravel Me or the other books in the Shatter Me series? Click to buy and help us pay for hosting! Oh and share this with your friends who might like to read a recap of Unravel me.